In a galaxy torn by war, the diplomatic skills and tranquility of Consulars are in short supply. Through discipline and understanding, they chart a peaceful course through any conflict. 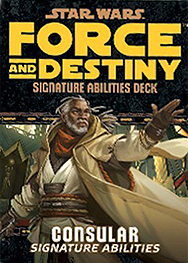 This deck requires the Force and Destiny Core Rulebook and Disciples of Harmony It includes 18 cards covering both Consular Signature Abilities and their upgrades.